Well, today marks the half-way point in our blog hop. Five projects shown, five more to go. If you arrived here via Melissa Stout’s blog, welcome! If not, you have jumped into a blog hop for the ten artisan finalists who were not selected for the Artisan design team. We are showing each of the projects we entered . My post today shows another of my scrapbook pages. It features my youngest daughter and is my simplest page. I did a lot of sewing on this page — all around the outside border, and then on each of the patterned paper rectangles. Now it’s time for you to venture on over to Sandie Conner’s blog so you can oooh and ahhh over her beautiful creation. Embellishments: Beau Chateau Side Notes, Early Espresso/White Baker’s Twine, Subtles Designer Buttons, Antique Brads, Basic Pearls Jewels, Boho Blossoms Punch, Itty Bitty Shapes Punch Pack, Scallop Edge Border Punch, Labels Collection Framelits Dies, Timeless Type Junior Alphabet Medium Sizzlits Dies, Billboard Sizzlits Decorative Strip Die, Color Spritzer Tool, Sponge Daubers, sewing machine, computer printer for journaling. 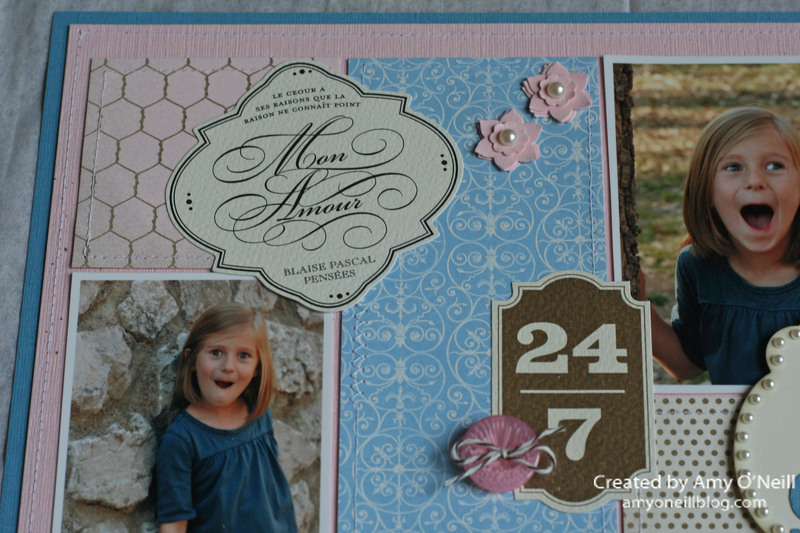 This entry was posted in Artisan 2012 Blog Hop, Scrapbook Pages. Bookmark the permalink. Scrapbooking really does come easily to you! Although you call it simple, it has so many wonderful details that keep pulling you around the page and the photos and journaling are so much fun. Well done! Great page! Love the design& colors. And your lil’ subject is too cute for words! !